As a young girl raised in Wisconsin, I dreamed a dream every little girl dreams of. Though only in the second grade, it has remained with me. Riding a horse through an "orange" cavern, similar to that of the Rocky Mountain range, I rode in stride, a beautiful red horse. Doesn't seem too incredible, until some 30 years later, I moved to GA where the ground is made up of orange clay! It was then I realized God had made my dream a reality..
One summer while visiting a high school friend in WI who raised Arabian horses, we visited, then purchased our first 2 "Family-friendly" horses; a little 2 month old Bay filly, (named Beauty) and 3 month old, Palomino stud-colt, known as Pal. 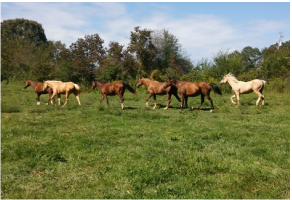 4 years later, Pal and Beauty married and four years later, Grace, another Palomino (filly) joined the family. Several years later, my WI family friend brought 2 other relatives to the herd, 1 year old Scarlett and her yearling, younger brother, Rhett, who were sired by Pal's sire..The family continued to grow. As time went on, God continued to bring the herd "family" together.. Enter Norman... a nine month old emaciated colt with fistulous withers came to Sweet Dreams to be rehabilitated. Norman was our miracle horse who many vets and others gave up hope for. He continues to thrive as our special needs horse on the farm. Tzion (Zee) was the next addition to the family, when Beauty and Rhett had a son, a handsome bay colt who looks an awful lot like his mama. Sallie was born a year later to Mandi and Rhett, a spunky bay filly. Four years later Sallie moved to her new home on Leah's farm, she has a new friend named Blaze and has settled in nicely. Mandi went to be with her girl, Angela on their new farm, where the "Old Gal" can happily retire. Just before Sallie and Mandi left, the farm had three new additions at once. Two Paint Ponies and a Miniature Mule, Millie, Billie, and Marvin. 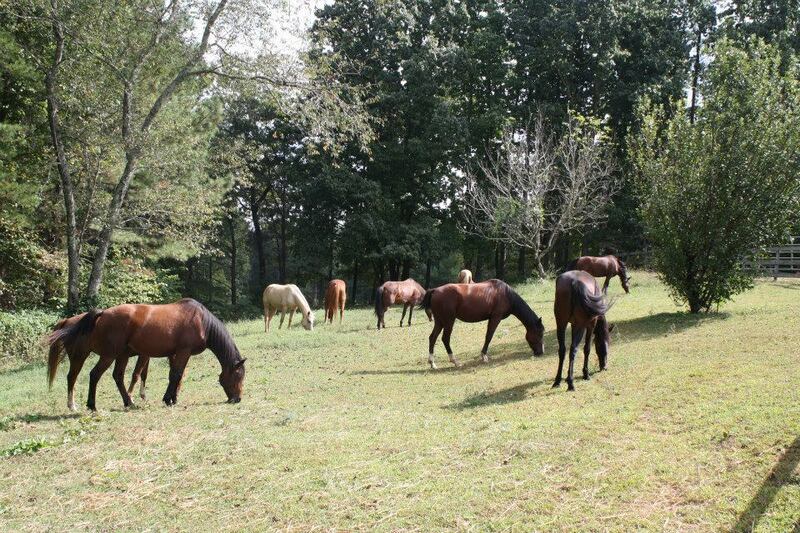 They were rescued in the Jasper/Elijay area and re-homed here. 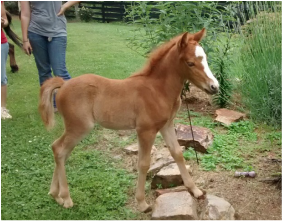 Almost a year after that the fourth member of the little rescue pony herd came to the farm, Willie (Now called Shiloh) joined the farm family. Just a year and a half after the ponies (and Marvin) came to the farm Millie turned out to be expecting a foal in less than three months! A few months later, on a cool summer night in May, Millie gave birth to a chestnut filly we named Glory, as the miracle of life is just one of the ways we see God's glory manifest itself.